How trading binary options trading opportunities to look at the illustration above requires just 2 actions. First, wait until the blue line intersects with the white line, which indicates the signal for getting besiap put option. Second, confirmation of such signals by viewing the appropriate candle patterns with the direction of the second indicator MACD line crossing. If both of these steps are equally revealing of the same trading signal, then immediately place the option with the expiry time 1 minute. The graph above shows the existence of profit opportunities, all of which 5 can be taken by applying trading strategies 60 minutes binary options. 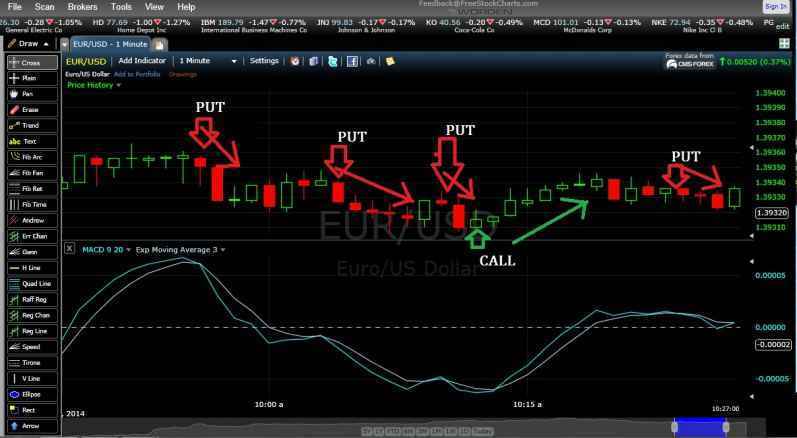 In addition to trading with MACD, 60 seconds in binary options can also be run with trading naked. You can observe the price action as well as chart patterns and candlestick that can guide you in analyzing the price movement of one minute forward.